This technical note sets out the procedures required to accurately Polar Align a Synta EQ3/EQ5/HEQ5 or Synta EQ6. Accurate Polar alignment is a specific requirement of any kind of Astro-photography as only by achieving this alignment can accurate tracking of celestial bodies be made and this is a prerequisite of photographing sky objects. The procedures herein apply only to the Northern Hemisphere. The night sky as we see it revolves around the North Celestial Pole (NCP) so if we can locate this point, we have a fixed location in space from which to align our equatorial mount. We are fortunate in the Northern Hemisphere to have an easily identified star (Polaris) very close to the NCP. This is our start point for polar alignment but for our purposes, Polaris is not close enough to the NCP to allow the alignment accuracy required to avoid star trails in long exposure photography. 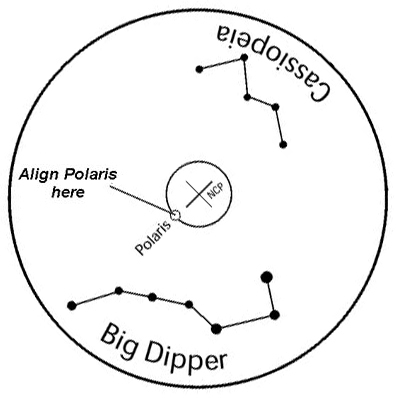 We need to know the exact location of Polaris in relation to the NCP at a given viewing time so that we can ascertain the true position of the NCP and the EQ3/EQ5/HEQ5/EQ6 mounts have the necessary calibration tools in the form of a Polar scope and circular slide rule already built in to allow us to do this. However, the Polar scope itself needs to be calibrated first to ensure the best possible accuracy. Levelling the tripod will make it easier to use the Azimuth and Altitude adjustments on the mount in the future when trying to centre Polaris in the Polar scope as the start position will be a constant. The latest version of the EQ6 has a built in bubble level but the EQ3/EQ5/HEQ5 and earlier EQ6 mounts can be made level by using an external bubble level or carpenter's level. Remove the caps from the upper and lower ends of the Right Ascension (RA) axis. 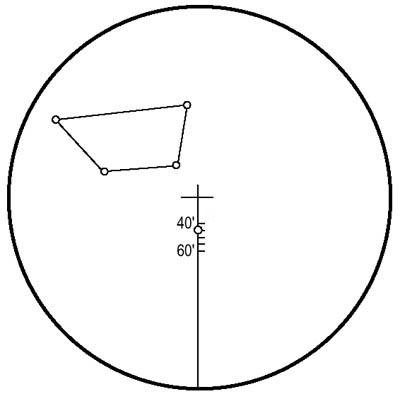 To use the Polar scope, the declination (DEC) axis must be rotated such that the hole in the shaft is in front of the Polar scope and the retractable counterweight rod must be released and fully extended. This allows the user to see all the way through the RA shaft. The reticules in the various mounts can differ markedly. 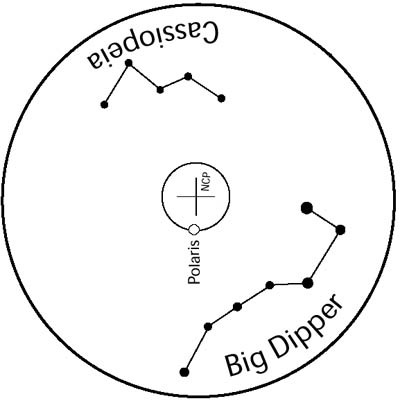 The following two diagrams show typical versions although the most modern have Octans as well as Cassiopeia and Big Dipper engraved on them. The optical axis of the Polar scope is already aligned with the rotation axis of the mount and can not be adjusted. This is set permanently at the factory. 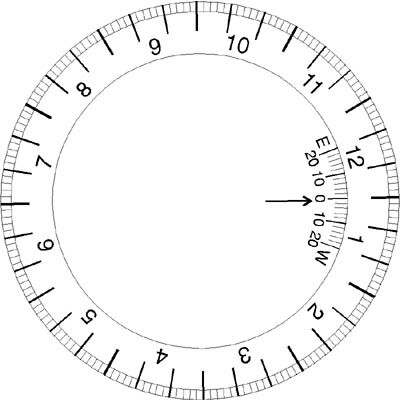 The reticule in the Polar scope must be centred on the optical axis of the Polar scope. When this is done, the reticule in the Polar scope will be parallel to the rotation axis of the mount. If this is not the case, accurate polar alignment will not be possible. Set up the mount on its tripod with a rough visual alignment on Polaris by sighting up the body of the mount in the direction of Polaris. 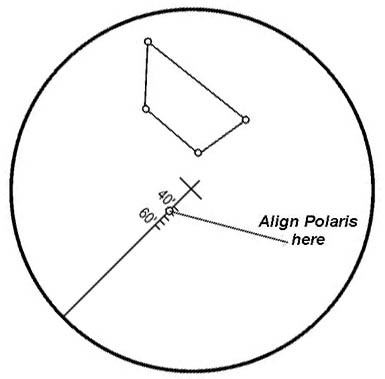 Locate Polaris and place it in the centre of the Polar scope by adjusting the Altitude and Azimuth of the mount. Place Polaris directly under the cross in the centre of the reticule (see Figs. 1 and 2 above for your reticule). Rotate the mount one half turn about the RA axis. Polaris should remain under the cross in the centre of the reticule. If it doesnt, the reticule is not centred on the RA axis of the mount and an adjustment must be made. If it is necessary to adjust the position of the reticule, adjust the three small set screws on the Polar scope (see Figs 3 and 4). Make very small adjustments by moving only two of the screws at a time. Adjust the screws to move Polaris half the distance back to the centre of the reticule. This is because Polaris started in the centre of the reticule and by rotating the mount 180 degrees, Polaris moved exactly twice the distance between the centre of the reticule and the centre of rotation. The centre of rotation lies midway between the centre of the reticule and the new position of Polaris. Do not turn any of the set screws more than one-eighth turn at a time or the reticule will disengage from the set screws. If this mistake is made, the reticule is re-installed by unscrewing the eyepiece and carefully seating the reticule (with its threaded retaining collar facing outwards) in the aperture of the Polar scope and gently tightening the set screws. Do not over-tighten these screws too much or the stress could fracture the reticule. Now re-centre Polaris under the cross in the middle of the reticule using the Azimuth and Altitude adjustments. Repeat the entire procedure until Polaris remains in the centre of the reticule when the mount is rotated about the RA axis. With some practice, you should be able to align the reticule with the RA axis to within about 2 arc-minutes. Once this adjustment has been made successfully, it should not be necessary to carry out this procedure again. 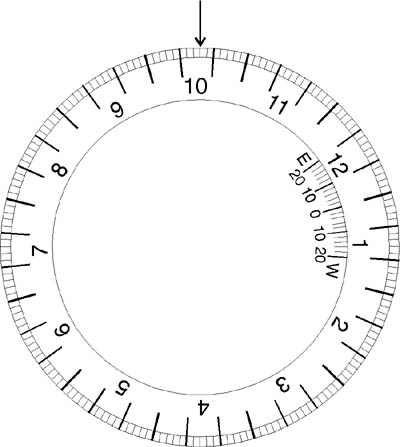 The Polar scope in combination with the RA setting circle constitutes a circular slide rule. This slide rule is used to calculate the hour angle of Polaris at your local time. For the purposes of explaining the calibration process, I am going to use October 16th, at 02:00 am, as from my location Polaris will be in transit at this time which means that when viewed in the Polar scope it will be at the bottom of the view. The index marker represents a 'zero' for the slide rule. If the zero is not set correctly, the calculated hour angle will not be correct. Unlock the RA locking knob. Rotate the telescope around the RA axis so the reticule is as shown in either Fig. 1 or Fig. 2 depending on the age of your mount  i.e. with the small circle on the reticule pointing vertically downwards. The reason it is pointing downwards in the polarscope view even though Polaris is in transit and therefore, above the NCP is that the polarscope produces an inverted image like most other telescopes. Re-tighten the RA locking knob to lock the RA axis. In this position, Polaris is in transit  i.e. it is at its highest point in the sky. 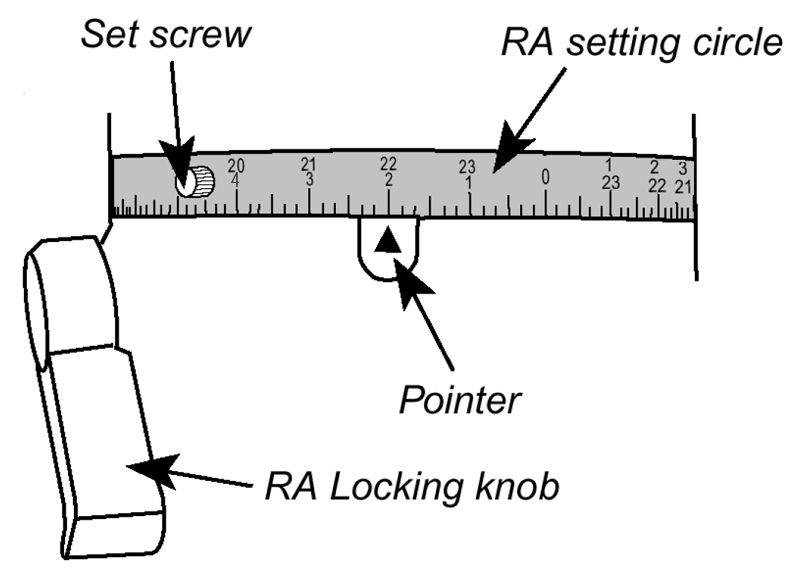 Unlock the RA setting circle by loosening the set screw. Rotate the RA Circle so the pointer indicates 'zero' and lock the RA Circle. This sets the first of two 'zeros' required for the slide rule. For the EQ6 only - Now rotate the telescope around RA axis so that the RA Circle indicates 2h 0m on the bottom set of numbers (see Fig. 6 for EQ6). Lock the RA axis. Rotate the Date circle so that October 16th is lined up with the pointer (see Fig. 7). I have chosen this date for the year 2011 because, conveniently, at 2:00 am local time, on October 16, 2011, Polaris is in transit at my location. 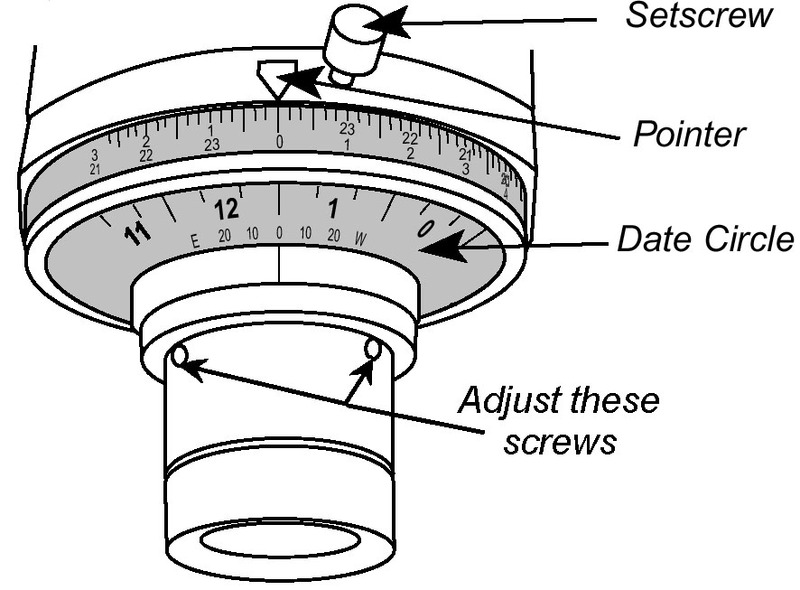 Next, loosen the set screw on the index marker ring and adjust it so the longitude scale on the Date Circle reads Zero (0) if you will only ever use the mount from your current location (Fig. 8). If you are likely to be observing from various other locations, rotate the ring until the Index Marker is aligned with your current Longitude offset, East or West of the reference meridian for your Time Zone. Secure the ring by tightening the set screw. This sets the second of the two zero points. In the future, if the reticule has been re-aligned or the index ring has come loose, this procedure must be carried out again to ensure accurate polar alignment. The Polar scope is now calibrated for your longitude and the Index Mark should be on the right hand side of the Polar scope as shown in Fig. 8. For the EQ3/EQ5/HEQ5 only- With the RA Axis still locked, rotate the Date Scale until October 16th aligns with 2h 0m on the top set of numbers on the RA Scale (see Fig 5 above to identify the two scales and Fig. 7 above for the date indication). I have chosen this date for year 2011 because conveniently, at 2:00 am at my local time, on October 16, 2011, Polaris is in transit at my location. The view through the Polar scope should be the same as before  i.e. with the small circle on the reticule pointing vertically downwards. 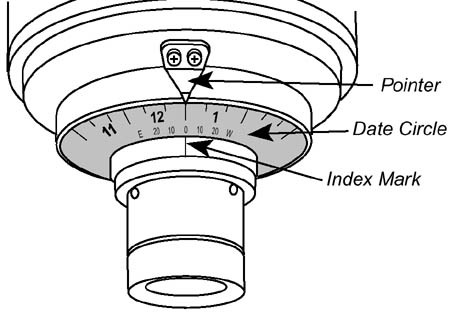 Next, loosen the set screw on the index marker ring and adjust it so the longitude scale on the Date Circle reads Zero (0) if you will only ever use the mount from your current location (Fig. 8). If you are likely to be observing from various other locations, rotate the ring until the Index Marker is aligned with your current Longitude offset, East or West of the reference meridian for your Time Zone. Secure the ring by tightening the set screw. This sets the second of the two zero points. In the future, if the reticule has been re-aligned or the index ring has come loose, this procedure must be carried out again to ensure accurate polar alignment. With the Polar scope accurately calibrated, it can now be put to use to ensure that the mount is correctly aligned with the NCP. 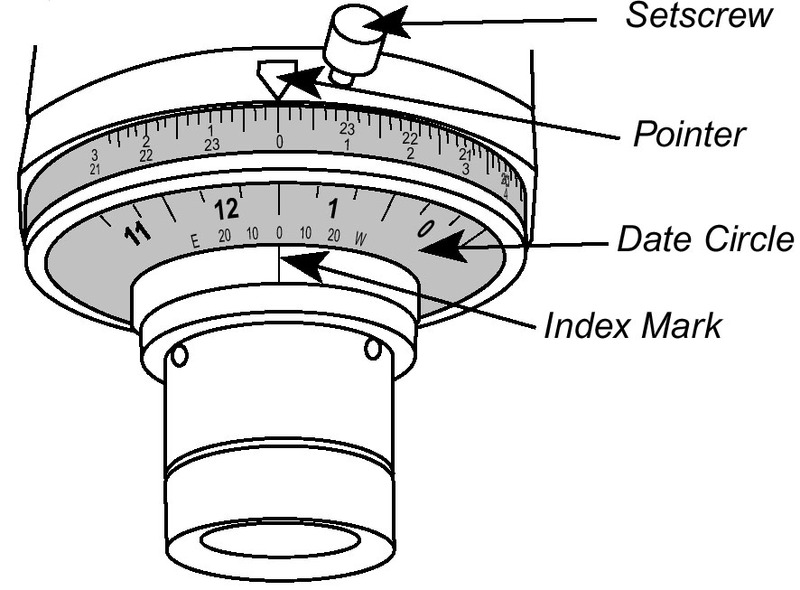 Rotate the Date Circle on the Polar scope until the Index Mark is lined up with either Zero (0) or your Longitude offset, East or West of the reference meridian for your Time Zone on the longitude indication depending on how you originally decided to set the Index Marker at the calibration stage above. (see Fig. 9 for EQ3/EQ5/HEQ5 and Fig. 10 for EQ6). For the EQ6 only:- Now rotate the telescope in RA axis so the pointer at the lower end of the mount points to today's date on the Date Circle (October 16th in this case  see Fig. 7). Tighten the RA lock knob to lock the RA axis in place. 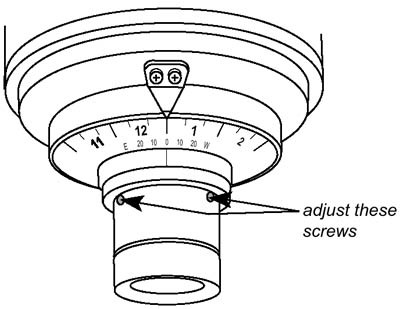 Loosen the thumb screw on the RA setting circle and rotate the RA Circle so the pointer points to the current time 01:00 in this example, on the lower set of numbers (see Fig. 6). Tighten the thumb screw to lock the RA Circle in place and rotate the telescope around the RA axis so the pointer points to 0 hours, 0 minutes. For the EQ3/EQ5/HEQ5 only:- Set the RA circle to 0 hours, 0 minutes and tighten the set screw to lock the circle in place. 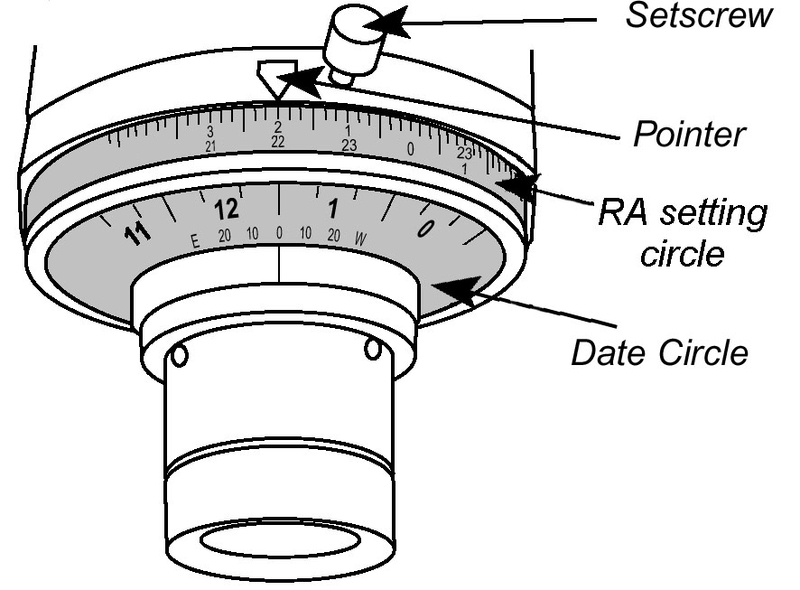 Unlock the RA lock knob and rotate the mount in RA until the current date on the date scale lines up with the current time on the RA circle. Note that on the EQ3/EQ5/HEQ5, the upper set of numbers apply. See Fig. 5. The Polar scope is now at the correct orientation to align with Polaris so using the Altitude and Azimuth adjustments on the mount, align Polaris in the Polar scope so that it appears in the centre of the small circle in the reticule (Fig. 11) for some mounts and Fig. 12 for others depending on your reticle style).